When Money is Worthless, What Next? I understand that inflation is one of the effects of supply and demand; increasing the supply of money in an economy lowers demand for it, making it less valuable. 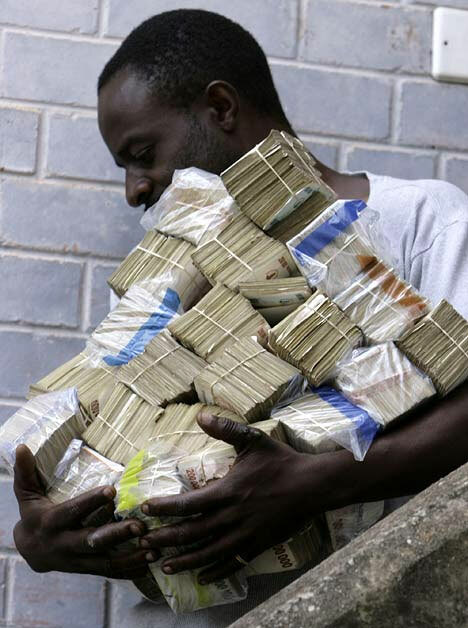 Zimbabwe’s economy has taken that to an extreme, with an estimated inflation rate of 90 sextillion percent. I can’t even wrap my mind around that number. It dwarfs inflation in Weimar’s Germany, which was a mere 850 billion percent and made wheelbarrows much more practical than wallets, at least for citizens that didn’t have five-billion mark notes kicking around and needed to buy a loaf of bread or two. So when so much money has been printed that it becomes effectively worthless, what can be done? Is there a restart button that can be pushed? I know that other countries have devalued their own currency, effectively doing the opposite of printing more money by requiring people to exchange their existing cash for bills that actually have a value, but what I can’t figure out is how people function in a country where money really has no meaning. If I have no money, I’m poor. I can’t buy the things that my friends and neighbors can. I will either do without, or people will give me things (goods or money), or I will find a way to earn more (converting my mental, physical, or spiritual energy into a form that I can convert into goods and services). But what if my friends, neighbors, and government are all poor as well? What happens if no one has any money to give me, and the work I can find doesn’t pay me enough to buy a cup of rice to feed my six children? How many steaks can I get if I butcher that cow? How many trips to Albany will that full tank of gas get me? If you knit me a sweater, is that as valuable to me as a hot meal? Money has failed to serve a useful purpose and is now no more useful than the proverbial ice cubes for Eskimos. The continuing existence of money in Zimbabwe is distracting from the fundamental truth that all value assigned by humans is based on human desire and need. If I start seeing numbers printed on my money that I don’t have names for, I’m signing up for a time bank. After all, I was taught not to invest in anything I don’t understand, and in Zimbabwe at least, I don’t even understand money. To put it in Pagan terms, money there has left the realm of Earth to exist entirely as Air – a real imbalance. I’ve been thinking a fair amount about how godparenting does – and does not – work in the Pagan community. I’ve got more than a few ideas, but I decided that before I put them all together that I would like to find out about the experiences of other Pagans as well. To that end, I have a questionnaire! You may respond in a comment or, if you prefer your answers not to be so public, comment with a means to contact you. If I would like to use direct quotes in any articles I write I will ask in advance. If you answer “no” to the first two questions, there’s probably no real need to continue, but thanks anyway! 1 – do you follow a Pagan, Neopagan, or other earth-centered faith? 2 – are you a godparent? 3 – how many godchildren do you have? 4 – any of your godchildren belong to a non-Pagan faith? email exchanges or spending time together)? 6 – what sorts of activities do you do together, if any? religious instruction, conversation, or activities? somewhat important, or not at all important to you? to your godchild?